Sorry the blogging has been a bit on the lean side lately but pretty much all the free time has been occupied playing bass in the bands I’m in. 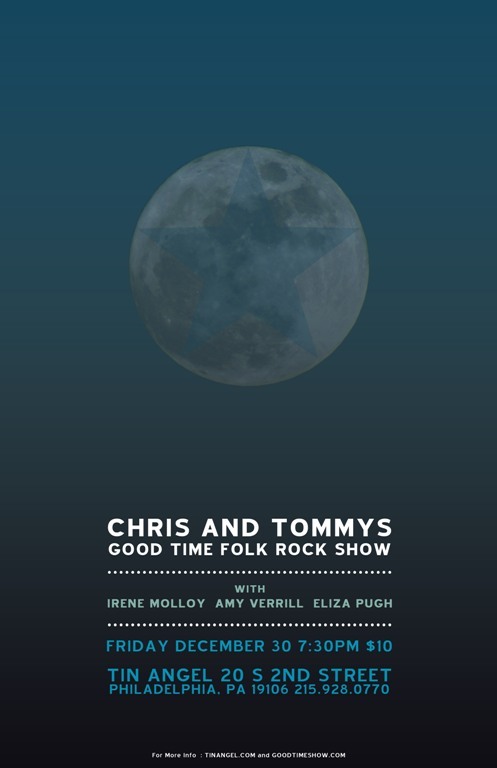 My friend Chris Nickey and I played over 50 shows throughout this past year year with our band Chris And Tommy’s Good Time Folk Rock Show and now we’re closing out 2011 in a big way with our first show at Philadelphia’s renowned Tin Angel. Come on out and help us celebrate on Friday December 30th. Grab a nice dinner downstairs at Serrano restaurant then pop upstairs and enjoy a great night of music. As our way of saying thanks for coming out we’ll have free T-Shirts,CDs,stickers for everyone as well few show posters to giveaway. Chris and I would also like to send out a big THANK YOU to anyone who has come to the shows and to all of the venues we’ve played this past year. It’s been a great time !